“In the early 1900’s, famed Irish author James Joyce wrote dozens of love letter to his wife Nora. 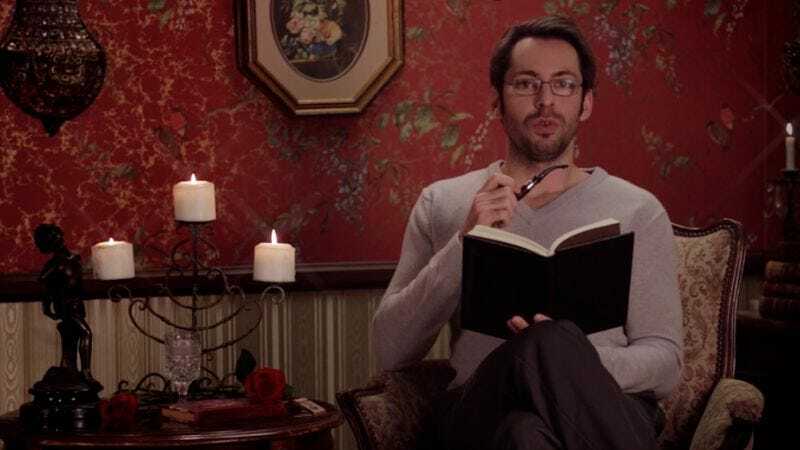 They were discovered many years later tucked into the sleeve of a long-forgotten book.” So begins “James Joyce’s (Actual) Love Letters (That He Actually Wrote),” a Funny Or Die sketch directed by Natalie Morales (Lucy from Parks And Recreation, Meg from Trophy Wife). The video features Martin Starr giving a droll reading of one particularly saucy missive from Joyce to his wife on December 6, 1909. It’s a private letter from a legendary author to his wife, starting with a description of her “drawers” and spiraling into significantly more intimate details. Starr’s dramatic pauses in all the so-wrong-they’re-right places only enhance the NSFW qualities of a graphically vulgar turn-of-the-century letter. Armed with an old-timey pipe, Starr is quite composed as a narrator, making it easy to laugh through the humanizing discovery that the same guy who wrote Ulysses also wrote dirty letters to his wife.